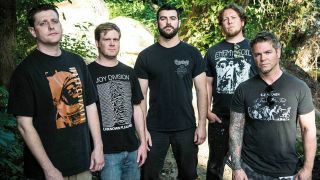 Five years have passed since Virginian grind gods Pig Destroyer released their last album, Book Burner. In that time, the world has started to enthusiastically circle the plughole, which probably means that a fresh dose of warped savagery from one of the extreme metal world’s most idiosyncratic bands would be very welcome. Currently piecing the new record together at guitarist and founder member Scott Hull’s Visceral Sound Studios studio in Bethesda, Maryland, electronics maestro Blake Harrison tells Hammer that fans should expect a surprise or two. So what’s changed since Book Burner? Pretty much everyone claims that their new albums are faster, heavier and darker than previous ones. Need we even ask? JR Hayes is famous for his twisted lyrics. Any clues as to what he will be singing about this time around? How do you explain the long gap between albums? Are you excited about playing this new material live?